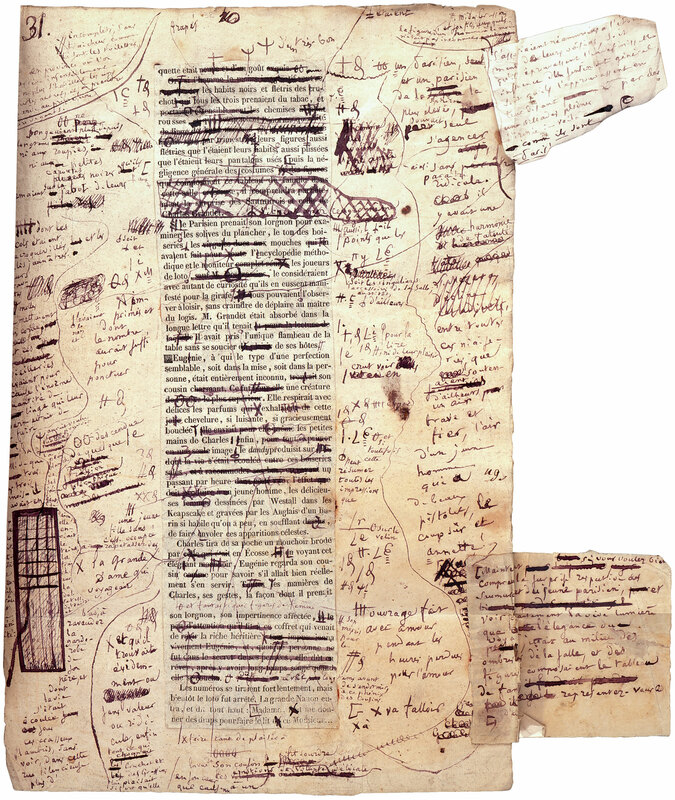 Eugénie Grandet : autograph manuscript of the novel : Genève, 1833 Dec. 24. With the author's signed presentation inscription to Madame de Hanska on the flyleaf: "offert par l'auteur à Madame de Hanska, en témoignage de son respectueux attachement 24 décembre 1833, Genève. H. de Balzac." Balzac married Madame de Hanska in 1850. Includes a diagram on the verso of p. 1; other pages include notes on the verso. With 41 leaves of corrected proof bound between p. 8 and 9 of the manuscript. Half green morocco, with the initials of Madame de Hanska on the upper cover. Given by the author to Madame de Hanska (later Madame de Balzac); sold at auction in Paris on April 25, 1882 (item no. 11) to Albert Cahen d'Anvers (through M. Etienne Charavay); by descent to his wife, Loulia Cahen (née Warschawski); by descent to her sister, Madame Edouard Kann (née Marie Warschawski); sold to the Parisian picture dealer Monsieur Barbazanges in 1921; purchased by Gabriel Wells in 1925; purchased by the Morgan Library from Gabriel Wells, 1925.